Our doctors know that kids are special and require special dental care. That is why our practice works hard to provide children of all ages with the very best dental care possible in a safe, nurturing and friendly office environment. There is nothing more important to us that making sure our young patients can enjoy a lifetime of excellent dental health! We help them do this by being a leading Bentonville kids dentist office that provides a wide range of pediatric dental services and on-going patient education. When your child develops a cavity, it is often on a chewing surface located on a back tooth. This is because the surfaces of the back teeth are not smooth. 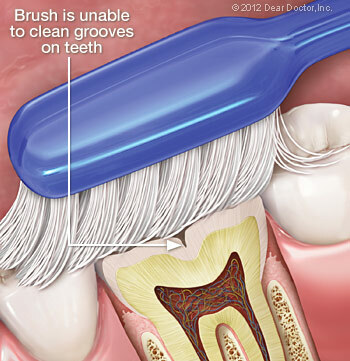 These teeth have tiny grooves on their surfaces where bits of food and bacteria can easily accumulate. Even if your child does a great job of brushing, it is very difficult and even impossible to reach all the way into these crevices with a toothbrush. Because a child's newly erupted permanent teeth are not as decay-resistant as adult teeth, it's important that kids drink water containing fluoride and use fluoride-containing toothpaste. Fluoride works by strengthening the enamel on teeth to help ward off tooth decay. But even when children drink plenty of fluoridated water, use fluoride toothpaste and visit our office for fluoride treatments, it is still difficult for fluoride to reach into the fissures of the back teeth. This problem can be resolved by having dental sealants applied to the teeth. Dental sealants are transparent plastic resin coatings your Katy pediatric dentist quickly and easily applies to your child's teeth to fill all those fissures and grooves on the teeth. When a tooth is sealed, it becomes very resistant to tooth decay which is great news for your child's overall dental health and your pocketbook as you can avoid paying for costly dental treatment later on. 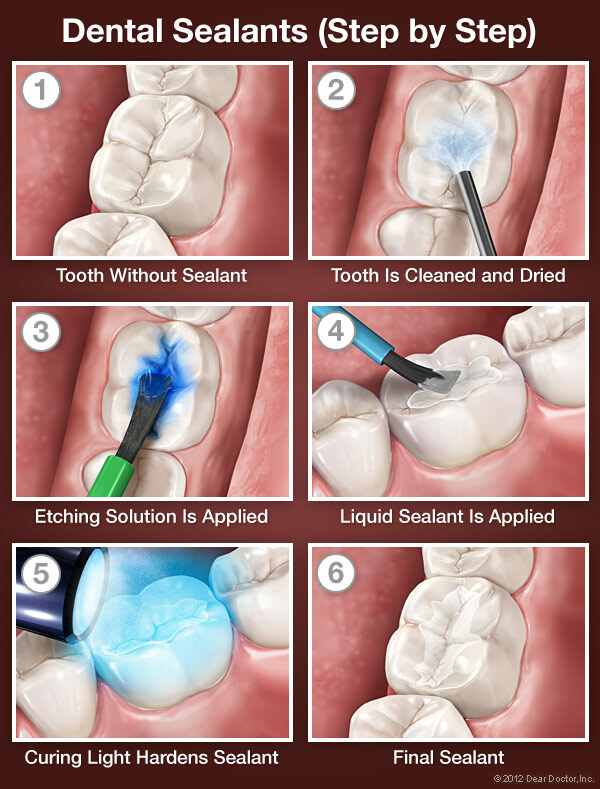 Applying dental sealants is fast, easy, painless and comfortable. The dentist starts by checking for any signs of minor tooth decay. If any decay is found, it is removed. Then the teeth are cleaned and dried. The next step involves applying a liquid solution that “etches” or roughens the surfaces of the teeth so the dental sealant will adhere better. Then the teeth are once again rinsed and dried. Your child's dentist then simply applies the sealant to the teeth wherein it hardens quickly. And that's all there is to it! A study conducted a few years ago received a lot of media attention to raise concern about trace amounts of BPA that's found in some dental resins that may contribute to behavioral problems in children. However, it was never proven that BPA found in dental sealants causes these problems. There is far more BPA in many packaged foods and drinks than what is present in dental sealants. And, both the American Dental Association and the American Academy of Pediatric Dentistry support the use of dental sealants. If you have any questions about this issue, free free to contact us so we can answer your questions. Not only are dental sealants fast and easy to apply to your child's teeth, but they're also easy to care for. All your child has to do is brush and floss well and visit us for regular checkups and cleanings. 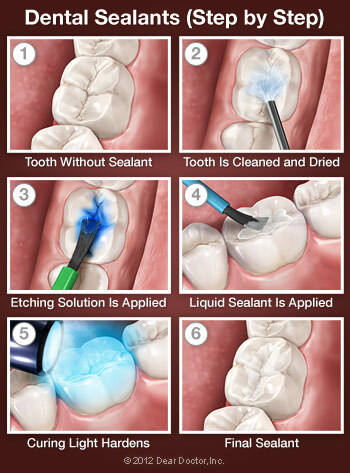 During these routine visits, we will make sure the sealants are in good condition. If you would like to schedule an appointment for your child so we can apply dental sealants to his or her teeth, please contact us at either our Bentonville or Roger office location. One of our friendly team members will then contact you as soon as possible to set up an appointment that's convenient for you.